Anaheim Extrusion can apply protective finishes that add durability to protect your products from a variety of climates, environments and conditions. We conduct critical tests to insure you receive the best, long lasting finish available. Creates a hard, durable and protective surface while enhancing the appearance of your products. 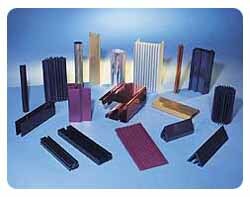 Anodizing is available in a variety of standard and custom colors. Provides a superior finish compared to 'wet paint', while offering enviromentally friendly protection. Powder Coating is available in a variety of standard colors or it can be custom color matched to meet your specific requirements.